Don’t buy a bigger system than you need. If you want to use Facebook and send emails, you don’t need a full-blown desktop system. A tablet will do. 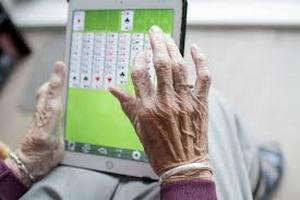 Touch screens are often easier for an older person to navigate than using a mouse. If you are having trouble seeing your screen, or hearing your audio, get help from MonTECH to learn about built-in accessibility. There are tools that can help! Write Julianna.Whittaker@mso.umt.edu and set up an appointment to learn more. Choose one goal to accomplish, of relevance to your life and of clear benefit to you! Do you want to video chat with your family? Watch cooking or home-project tutorials on YouTube? If you worry about scams or unwanted contacts but still would like more social interaction with friends and family, there are devices with limited options designed to address these safety concerns. GrandPad is one example. If you have to revisit something, revisit it. No big deal. Be patient with yourself. You don’t have to switch off your device when you’re not using it. If you’re using your device to communicate, friends and family won’t be able to contact you if your device is off. Just charge it as needed. Ignore pop-up alerts that your computer is infected or needs a fix. Log out, restart, and run a scan of your anti-virus software. You can call your IT support (or anyone younger than 30…yep, I said it) to find out how. If fraud is an area of particular concern, you can check out AARP’s Fraud Watch Network. Don’t let fear stand in your way. Arm yourself with information. Technology can open up the world for you! Go boldly! Never Too Old to Tango with Tech!